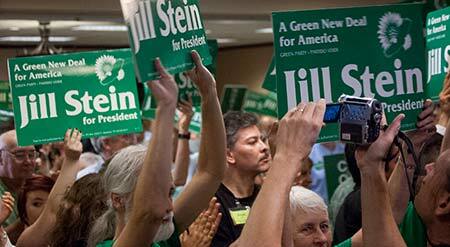 Jill Stein MD announced Friday she has formed a committee to explore the option of pursuing the Green Party’s presidential nomination after winning it in 2012 and subsequently receiving the highest percentage of the popular vote of any female presidential contender in a US general election — a percentage triple the one garnered by her party’s previous standard-bearer. Those who accepted that nomination in 2000, 2004 and 2008 declined to go for it again. Now, all who share Dr. Stein’s basic vision should stand by to take advantage of her consistent and respectable leadership. Someone with similar values, Senator Bernard Sanders of Vermont, also may seek this nation’s highest office but has not used his stature as an independent official to help build a third party, which the people of the US need and want*. The ex-mayor of Burlington is apparently unwilling to do so in the 2016 cycle. Additionally, the longest-serving independent member of Congress in US history says if he were to wage an independent campaign, he would suspend it if in fear of being “a spoiler.” Assuming the Democratic nominee in that case would be a corporatist such as former secretary of State Hillary Clinton, though, I assert the adage that one cannot spoil what is already rotten. Nonetheless, Sanders seems inclined to run as a Democrat if at all even though the Democratic Party has — despite continual polls showing most in that party and in this country at large are liberal on most issues — followed the Republicans rightward for decades and would therefore be unlikely to welcome him, a socialist. Furthermore, I thought the highlight of a Democratic bid by Sanders might be his performance in the primary debates, yet we read Clinton is thinking of simply ducking such confrontations. As the US endures 23.2% unemployment, the largest wealth gap since before the Great Depression, and other urgent problems, we should not want the entry of a presidential candidate who might effectively pull a bait-and-switch by setting forth a leftist platform that will draw people into the political process and then, upon losing the primary race, encouraging them to vote for the status-quo in the general election. If Sanders were to somehow clinch the nomination, his coattails would — barring a deep revolution in the party — be rolled out for, mainly, the same type of Democratic politicians who have resisted the overwhelming majority of his ideas thus far. The Green standard-bearer, however, will surely head a slate that is devoted to populism and lead a party that will keep fighting for it beyond the next administration. *Gallup’s description of the Democratic Party as center-left is false. Both major parties are center-right.